The Egyptian Exchange (EGX) opened Tuesday’s trading session in red territory, dragged down by local and Arab sell-off. 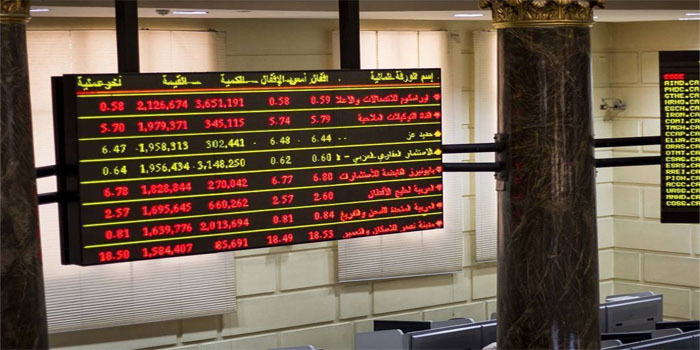 By 10:30 am Cairo time, the benchmark EGX30 index slipped 0.42%, to 14,847.83 points. The small- and mid-cap EGX70 index dipped 0.07% to 694.72 points, while the broader EGX100 index slipped 0.12% to 1,761.9 points. The equal-weighted EGX50 index tumbled 0.35% to 2,429 points. Meanwhile, trading volume reached about 19.28 million exchanged at EGP 81.66 million through 1,600 transactions. Foreign investors were net buyers with EGP 1.4 million, while Egyptian and Arab investors were net sellers with EGP 1.13 million and EGP 363,600, respectively. The heavyweight Commercial International Bank (CIB) inched up 0.0.4% to EGP 68.8.